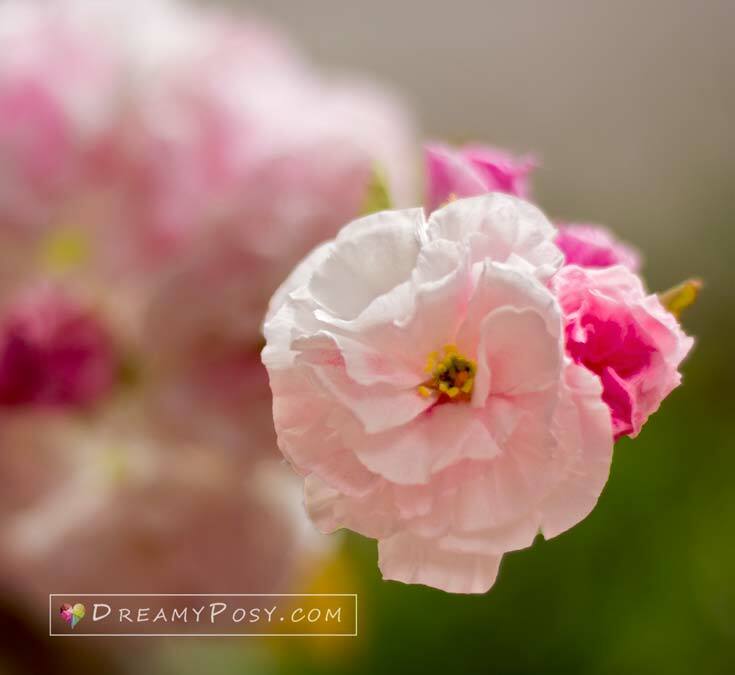 This paper cherry blossom tutorial is my effort to replica my dreamy flowers. The Japan streets are full of all kinds of blossoms at this moment. 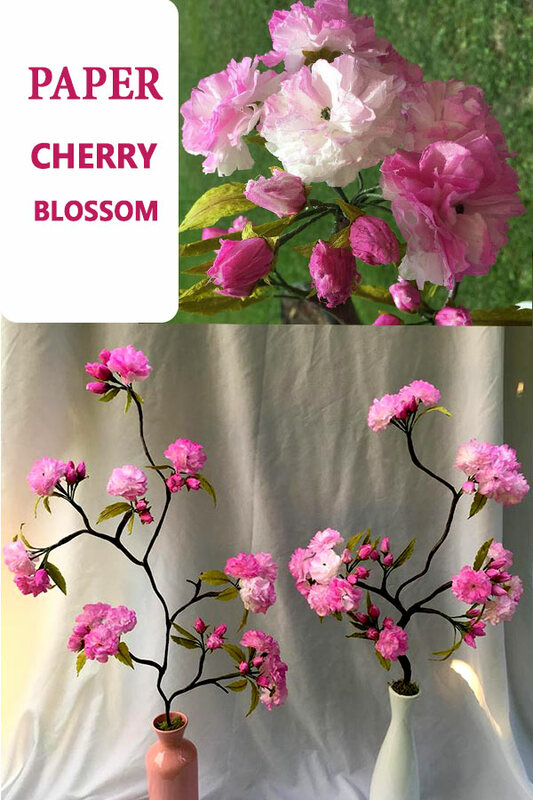 Wanna have some cherry blossom branches in your room? Let’s scroll down. Cut the straw into 70mm sections. Use the lighter to burn one head of the section, just enough for it to have a little curve. Yellow paint that curves and use the scissors to cut the section as a tiny eyelash. Cut the wire gauge 26 into 7cm sections and glue them with those eyelashes to make the stamens. Add a little lime-green paint in the center of the stamen. Note: I’ve run out of green floral wire so I use the white one. But the real cherry flower stem is green. Step 3: Cut the cherry petals from tissue paper. 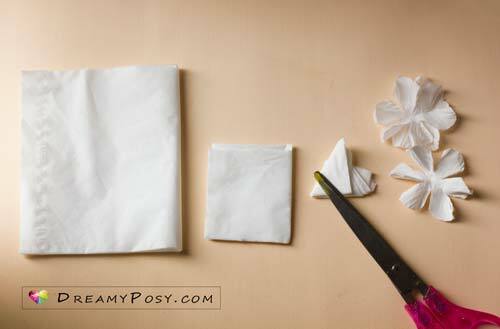 Cut the tissue paper to about 5cm squares. Fold the square 3 times and cut the 6 petal flower shape. The diameter of the flower should be around 4.5cm only. If it’s larger, the flower will not stiff enough. If it’s smaller, it will take more time to have a branch. 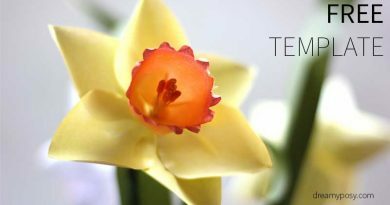 Cut many layers at the same time, twist the petal to shape the ridges and help you to separate the layers easier. Step 4: Insert the layers of petal into the stamen. 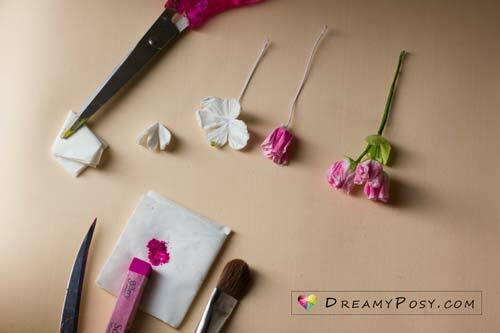 Color the flower with ground pink pastel chalk, with the help of a small brush. Step 5: Make the cherry buds from beads and facial tissue. The paper blossom branch will be more beautiful with buds, a lot of buds. 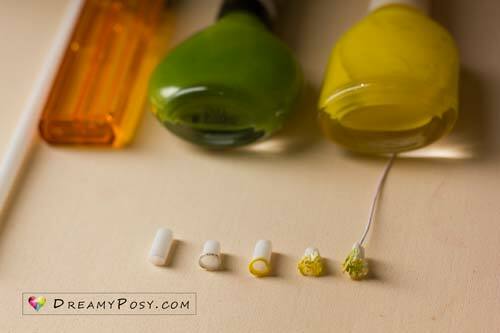 Cut a small flower shape of about 2.5cm diameter, cover the bead by a glue gun. Gently twist the head of the bud to make it more realistic before coloring it with pink powder. Step 6: The cherry leaves are not lime green nor green. So I have to color the lime green paper with orange color before cutting and gluing with the floral wire. 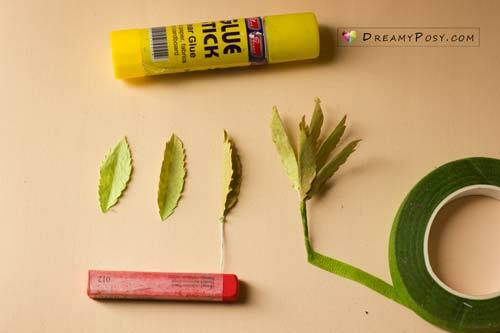 Please watch my video tutorial for detail technique to make different size of leaves. 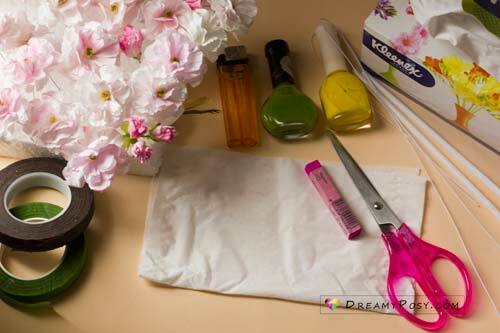 Wrap the buds and the flowers into small groups with green floral tape. Then attach those groups to a dried branch with brown floral tape. 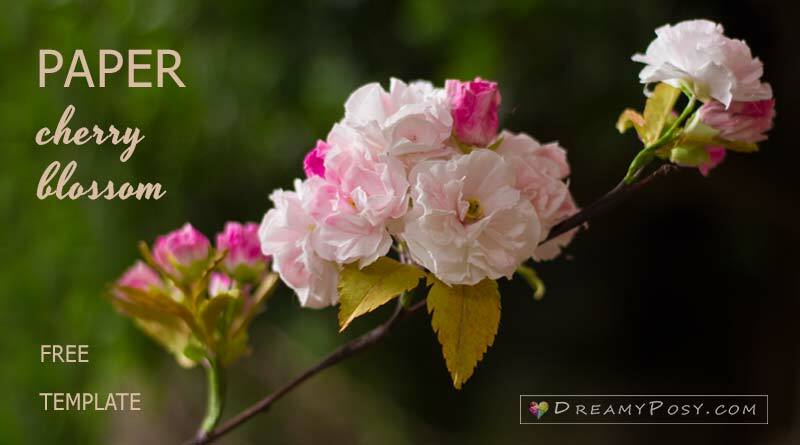 Try to make different tones of pink and white pink will help your branch so stunning. 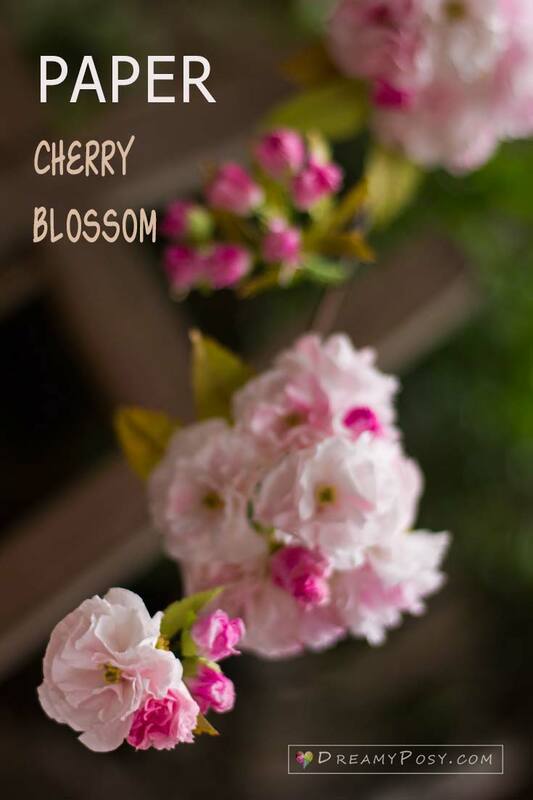 And below are the paper cherry blossoms made by Noelle LeBlanc Addlesberger. How dainty and delicate they are. Instead of using pastel chalk like mine, she used Tint It spray paint and used a tear shape wooden bead for the buds core. It worked perfectly, her blossoms are much prettier than mine. 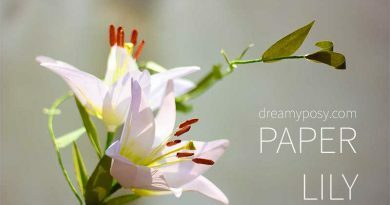 I always try to replica from real flower. Here is the inspirational picture for me this time. I opened it on my computer all the time of crafting this flowers. I made 5 failed flowers until I’m happy with this technique. That’s it. There is no secret, just keep practicing. And finally, I always feel that I’m so tiny tiny tiny under the Mother Nature. 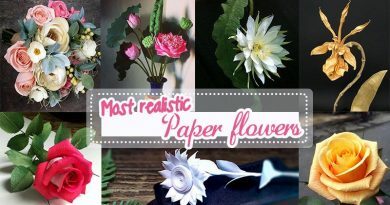 Well, we could make many paper flowers from very simple suppliers. 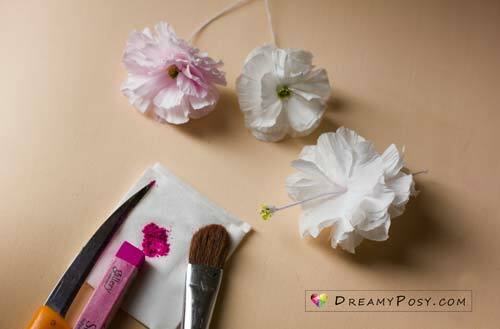 Please bookmark these paper flower tutorials from facial tissue, as there will be more. 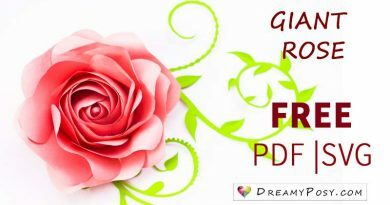 These cherry blossom tutorial doesn’t need any template, dear. Pls watch my video to see how easy I cut it. Thanks. How do you make the leaves ? Is there an easy way to cut the edges of the leaf ? and which paper do you use (120gr/m2) ?